Elote, the ever popular Mexican street fare that is seen both on a stick and served in a cup with a spoon. 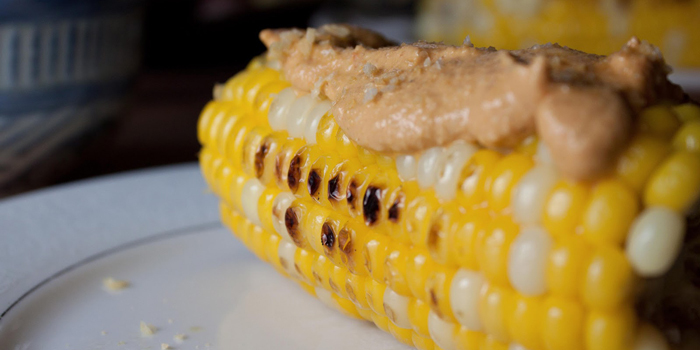 Is it the golden charred corn or the the scrumptious toppings that lures peckish patrons in? Honestly, the corn just becomes a vessel for the creamy mayo, crumbled cheese and lime. But just thinking about the juicy corn nibbles rolling down my forearms makes me want to lick them now. It’s in my DNA to tweak recipes so you know already my version is going to have a twist or two. First enter twist one – there are sad people out there who can’t (or don’t) eat dairy. It’s torture to watch your friends slobber over their dressed up corn while you push around your naked cob. Until now. 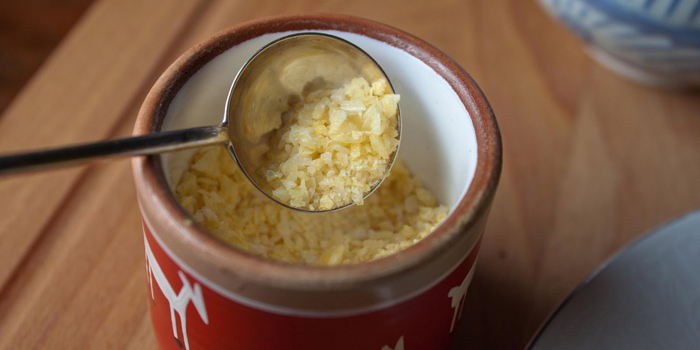 With the help of raw cashew, it’s a snap to make a dairy-free cream. It sounds daunting, I know. The idea of “soaking cashews” sounded challenging, difficult and not all that yummy. But once I finally worked up some ambition to give this a try, I’ve learned cashew cream is pretty simple. The hardest part is to remember to soak them before you need them. Add in chili pepper, garlic and some fixings, and the results are sorta magical. Twist number two: a package of citron salt landed in my mailbox as a strange ingredient. What if lemon replaced the typical lime in the Elote? The pale yellow nodules created perfect harmony with the corn and pepper cashew cream, not to mention adding a real nice little crunch too. A Fat and Happy Elote experiment gone right. Oh, did I mention how much healthier my version is? Place the cashews in a glass bowl, cover with water, cover with a lid, place in the refrigerator and soak overnight. Soak the seeded and de-veined ancho chiles in hot water until they soften, about 10 minutes. Drain and rinse the cashews, place in the blender with the softened chiles, roasted garlic, onion and just enough of the chili soaking water to just to move the blades of he blender. Start with about 1/4 cup and add as needed, being careful not to get the cream too runny. Blend on a medium-low speed until the desired thickness is reached. Don’t worry about pureeing exactly smooth. Having some small cashew chunks will give an interesting texture to the cream. Add a dash of salt for a little flavor at this point. Grill the corn in your preferred method (I like to boil them first before placing on the grill to help keep the corn from drying out). Remove from the grill, pour a big spoon of pepper cream over the corn and sprinkle with the citron lemon salt. Serve immediately while the corn is warm. Fat and Happy Food Blog Tips and Techniques: When this dish is served with the corn kernels still on the cob it is referred to as Elote; but it is typically called Esquites when served in a cup. For those of you who can’t eat corn, just drizzle this pepper cashew cream over roasted veggies. For the best effect, roll up your sleeves and use your fingers to eat it!